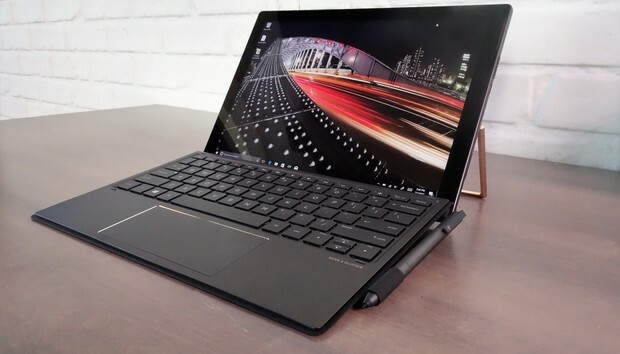 Our review of HP’s Spectre x2 12.3-inch 2-in-1 tablet begins with a simple question: Can HP continue its tradition of being an elegant, yet durable alternative to Microsoft’s Surface Pro flagship? The answer is Yes. 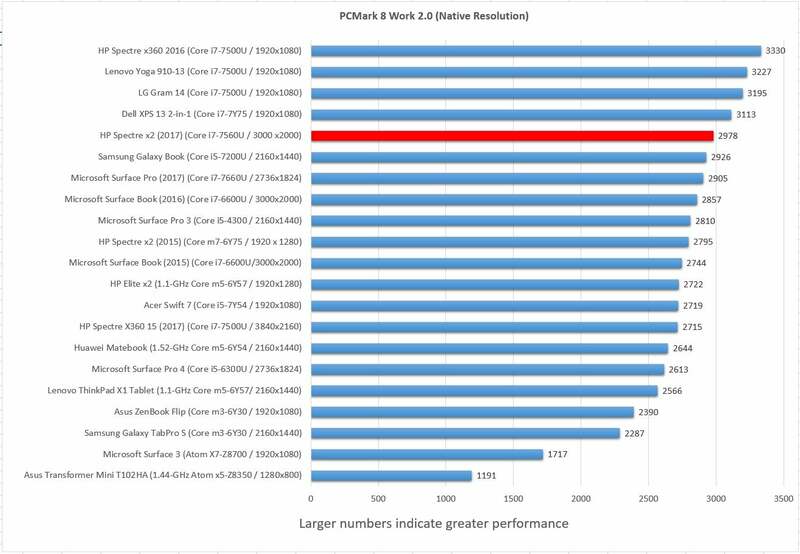 HP took the best bits from its Elite x2 tablet and the first-generation Spectre x2 tablet (2015), then updated the new Spectre x2 with the latest Kaby Lake chips. 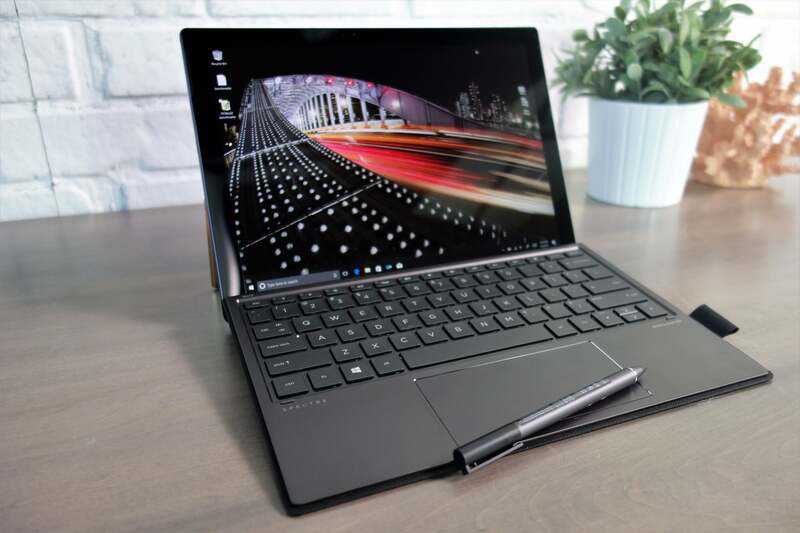 The Spectre x2 gives you more features for the money than the Surface Pro: Our $1,300 review unit included both the keyboard and the stylus right in the box (hear that, Microsoft?). It’s a shame this solid value is let down by middling battery life and a pesky fan. All the versions use Intel’s Iris Plus 640 integrated graphics and a 12.3-inch touch display with 3,000x2,000-pixel resolution behind Corning’s Gorilla Glass 4. This display is a big boost over the first-generation Spectre x2’s 1920x1280 display and even the new Surface Pro’s 2736x1824 display. According to our light meter, it pumps out up to 411 nits, a surprising amount of light for a tablet. 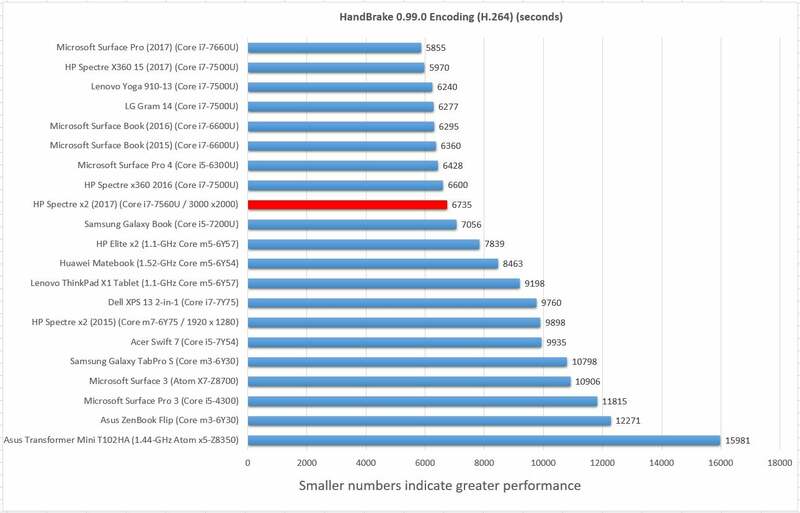 You’d have to go back to the Surface Book or the MacBook Pro to surpass it. 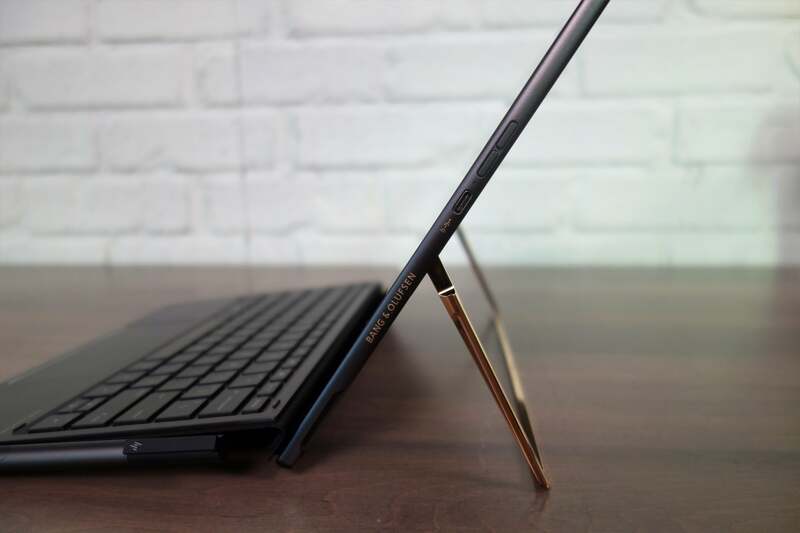 A 2-in-1’s kickstand, keyboard, and stylus bridge the gap between tablet and traditional clamshell. 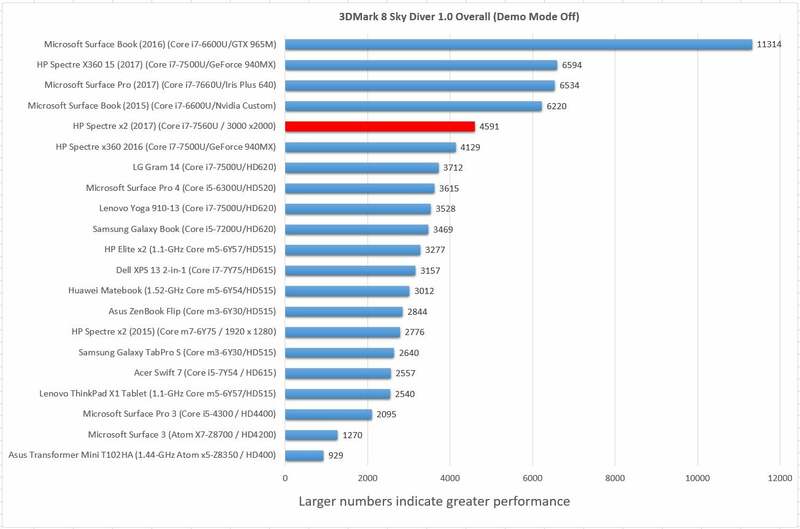 The Spectre x2’s components are net positives. 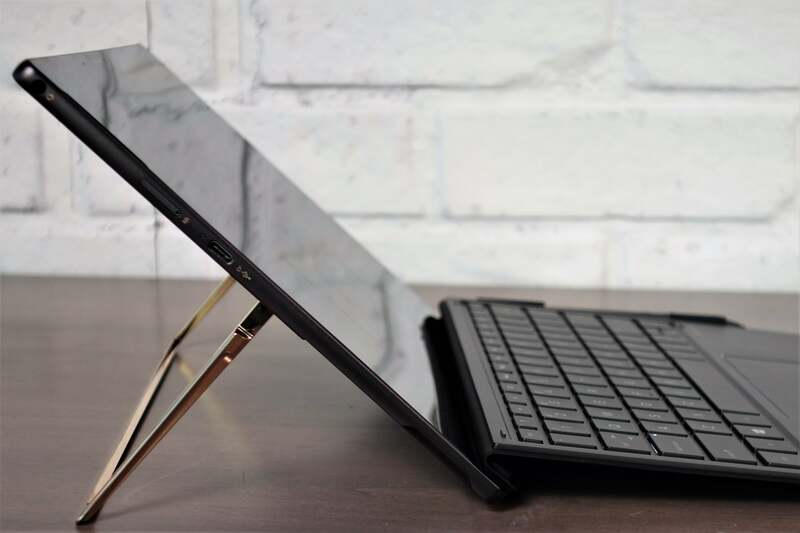 One of the strongest points about HP’s prior-generation tablets was, well, its strongest point: the sturdy metal kickstand, which returns this year with a luxurious copper finish to accent the ash-black color of the chassis. 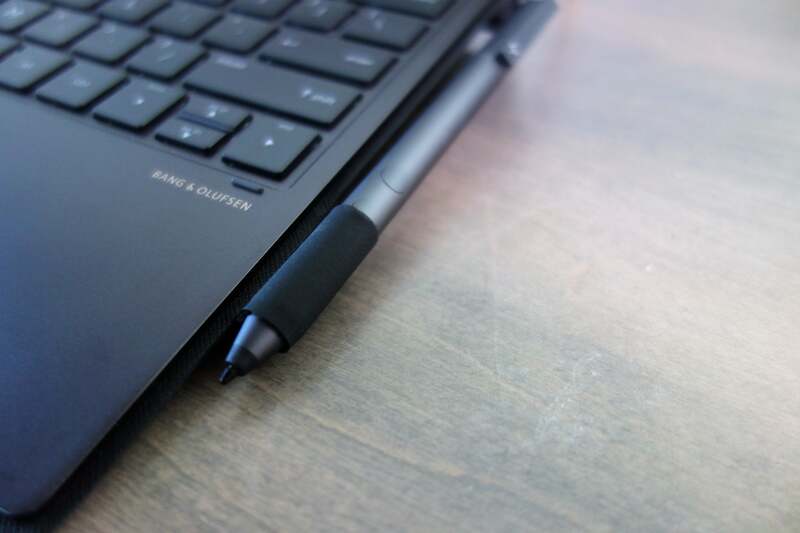 HP asked us to compare the experience of inking on the Surface Pro to the Spectre x2’s. 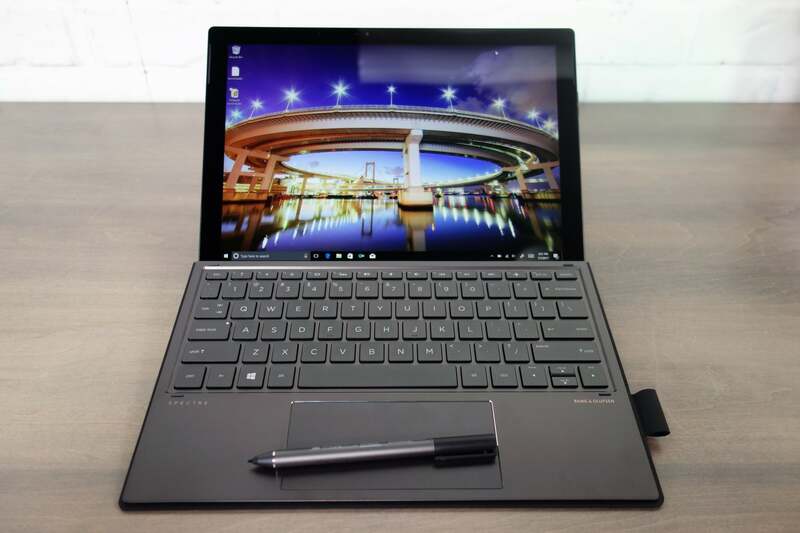 As HP promised, if you’re inking with the tablets fully reclined, the Surface Pro bounces a bit, while the Spectre x2 offers a better, more stable experience. However, it’s also worth pointing out that the Spectre x2 doesn’t recline as far as the Surface Pro—just 150 degrees compared to the Surface Pro’s 165 degrees. HP also ditched the slider switch that freed the kickstand from its moorings, apparently due to user feedback. However, trying to flip the kickstand open with a fingernail requires a bit of fumbling around. The Spectre x2’s keyboard is good. While Microsoft prefers to wrap its Surface keyboards in Alcantara fabric, HP has traditionally used an aluminum layer above a plastic foundation. 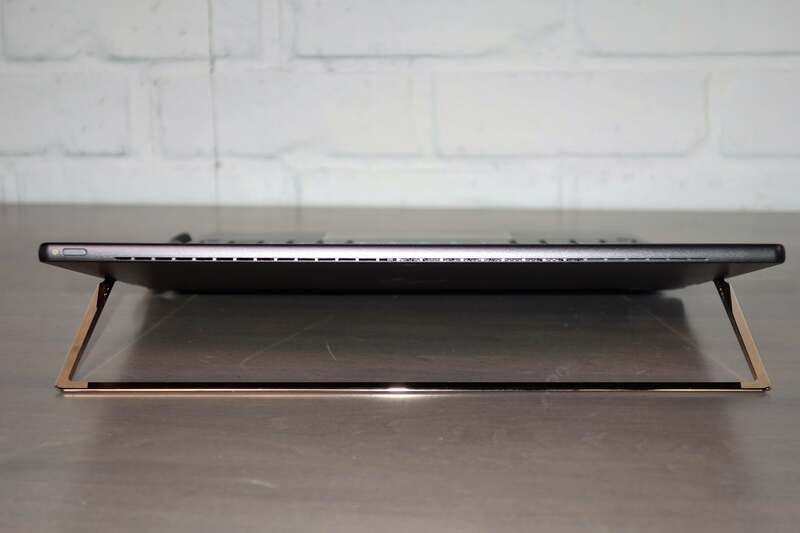 The aluminum is not structural, as you’ll still see the slight bowing that characterizes other 2-in-1 keyboards. But the Spectre x2’s version also boasts a full 1.5mm of key travel, providing a comfortable, responsive typing experience. The elongated touchpad also works well. Oh, and the weak keyboard hinge we complained about with the HP Elite x2? 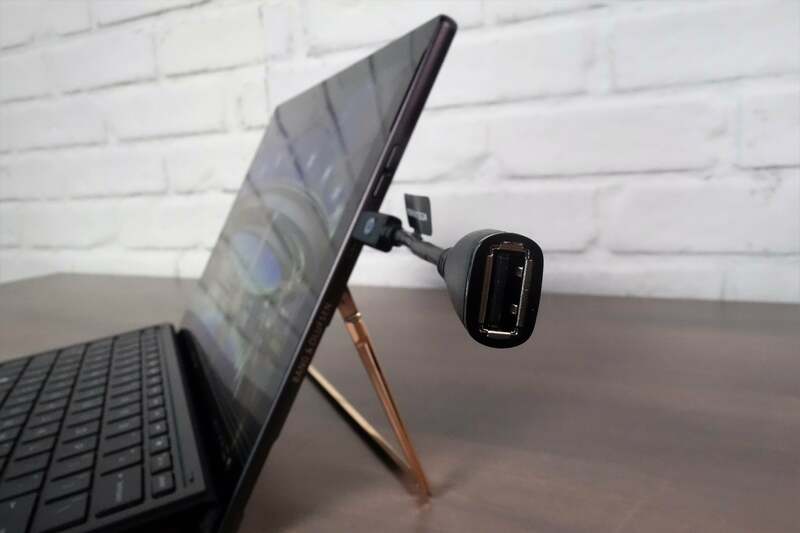 Solved: HP’s Spectre x2 is rock-solid on your lap, even though HP claims it’s best perched on a table or desk instead. Oh well. HP’s Spectre x2 includes several additional apps beyond the normal Windows selection, including HP-authored software. We’re always on bloatware alert, but these apps are pretty useful. Some step in and replace Windows functions with HP’s own UI, such as the HP Pen Control for configuring the buttons on the included stylus. 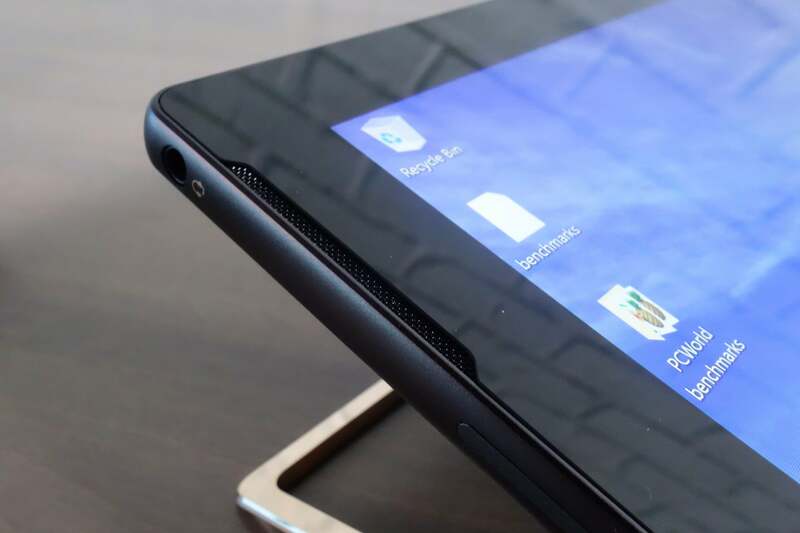 HP JumpStart provides tips, tricks, and a tour of the tablet. The company also discloses that it collects anonymous info on how you use JumpStart to improve the app. A pair of apps, including HP Audio Switch, provide finer-grained audio controls. 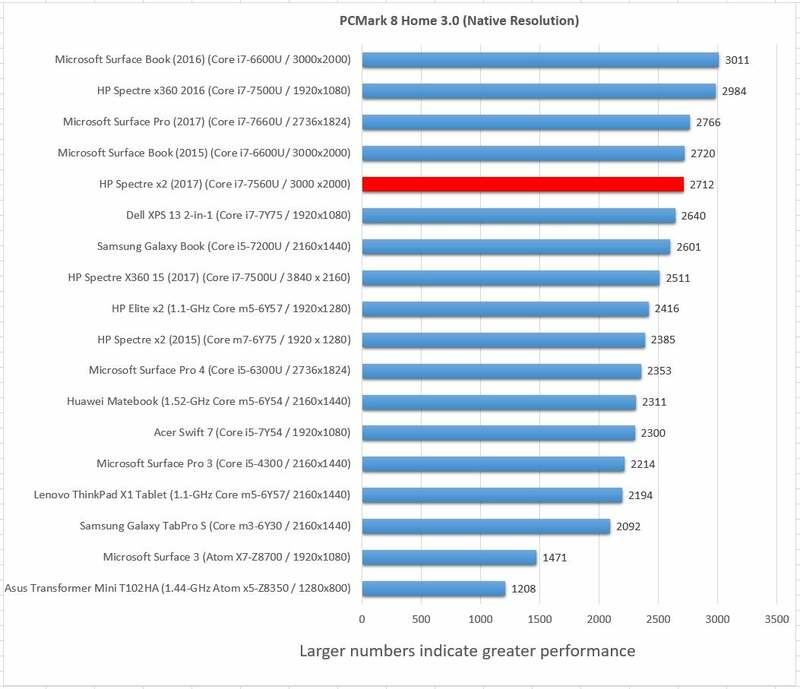 We didn’t have enough time to test the Spectre x2 on any mainstream games, but we broke out the part of PCMark’s benchmark that tests what is termed “mainstream” DirectX 11 gaming, complete with frame rate. 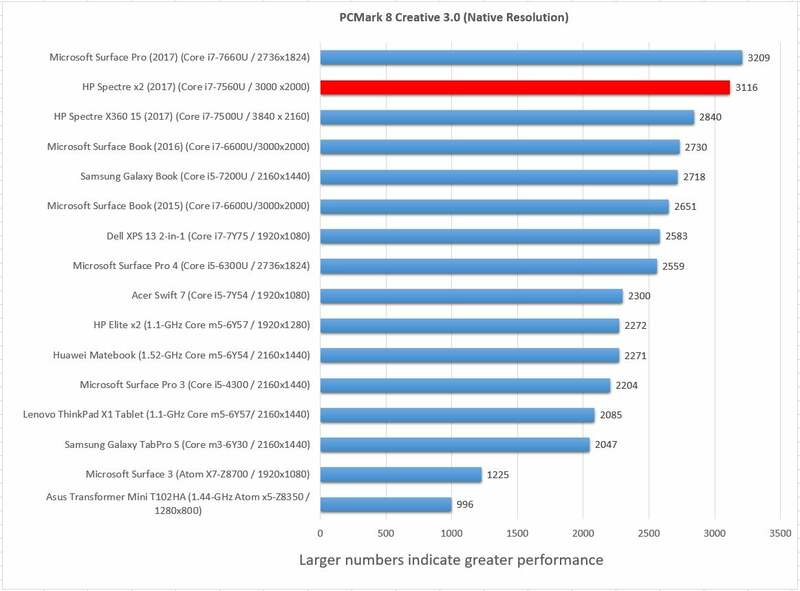 With scores of 13.2 frames per second and 6.5 fps at native resolutions, you’ll clearly have to dial down the resolution to achieve playable frame rates. Battery life, though, left us wanting more. We typically set the display brightness at about 250 nits (a viewable level for a bright room), then loop a 4K video over and over until the battery runs down. That gives you an idea of how long a tablet would last on a long flight’s worth of movies. The Spectre x2’s battery life of about seven hours is lackluster. 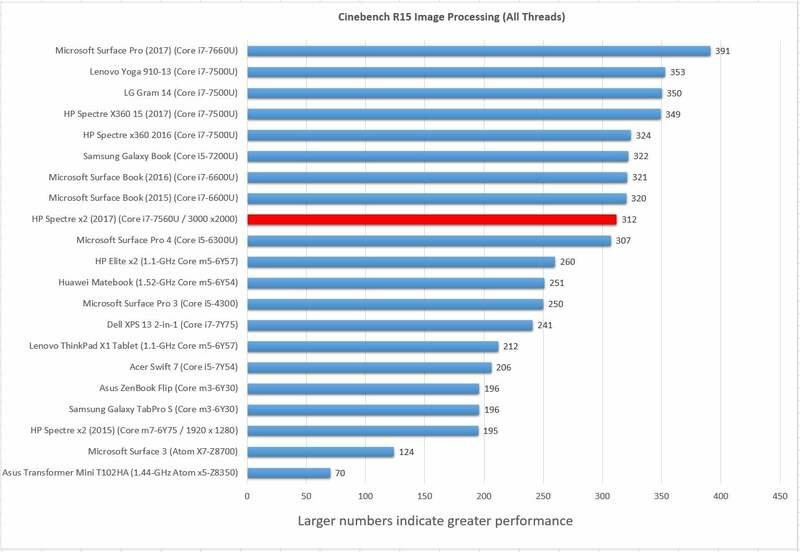 Sure, it’s a step up from the older Spectre x2, but we’d like to see this number climb a bit higher. 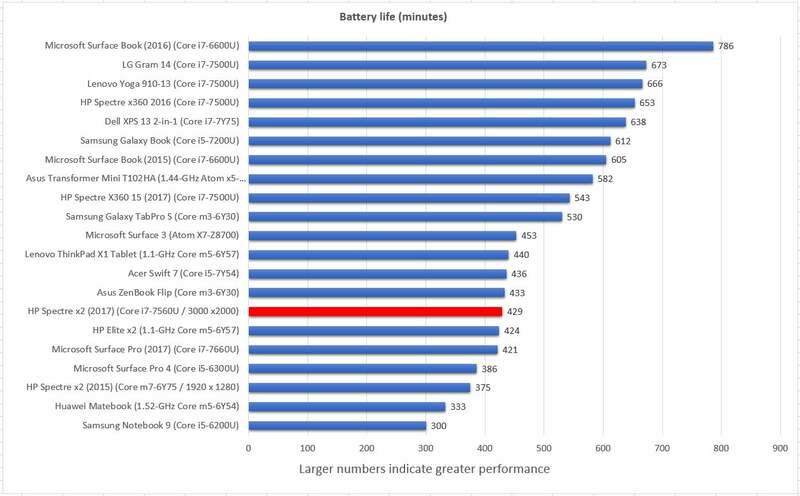 Battery life is simply too important for a mobile device.